Unlike creating a 3d animation, I can be dead exhausted from stone work all day, and still play an instrument. This is why I'm putting 80% into the animation now (while I can avoid a full time job), and then if I can't maintain this part time life style I'll put 80% into the music instead (after a full days work). Also the advantage of playing an instrument is that you don't have to look at a screen. Any reason to escape the screen is welcome, seeing as I only manage it for a tiny proportion of my day. However you do it Carrara and music are a powerful combination!! Wow... another "me" talking, there! Sweet! Yup... I love to jam, and no screens needed! Just got back from getting Rosie a new 9" Nook HD+ for her Hulu and Vudu endeavors - so I'm going to get back to exploring Samplitude - before continuing on to look at/for other options. I may as well hit "Buy Now" button for that Miroslav Philharmonik. DAW or no DAW - I'm getting that for sure. It's really looking like I'll be matched up with Samplitude, so far. Opening one of its demos that downloaded is showing a very complete recording experience for PC. We'll see though. Okay, still a bit chaotic around here, making my studying slightly delayed. This study, btw, is currently replaying most of the Samplitude tutorials I watched last night, but this time Magix was kind enough to download them to my HDD, so playing them is, well, smoother. Being a Sony fan, I decided to take some of the breaks amongst the chaos to check out the less expensive offering of Acid by them. It would likely patch up with the rest of my Sony HD products, and boasts all of the features we've talked about in this thread. It, too, has several tutorial video available online. If you've ever used Sony software, you'll also know that they incorporate excellent learning tools and tutorials directly into their applications. Usually in the form of guided popups telling you what to do next - depending upon what you told it you wanted to learn about. Pretty neat. sorry... just a little overwhelmed with glee. Okay... back to learning Samplitude, then I think I'll check out Acid some more. Looks very similar and Sony-cool! Another advantage for me getting Sony products is that if I ever decide to upgrade just one thing, they'll give me Gigantizoid deals on upgrading the rest to Pro. Magix is like that too... as are the developers of Reaper... so I guess I can shop with confidence. CU Base and the one Andy uses are out of my reach for budget. I know... ya git whatcha pay for... but it's the paying that I'm having a hard time with. Besides, I've always been good with making something great from not a lot of anything. And these things just seem to be made of some pretty darn nice stuff. It was just a few years ago that I found myself going through a similar decision making process as yours. I needed some music for a portion of a DVD that I was making, and nothing seemed quite right. I decided that I needed to create something. As I am not a musician, I wasn’t quite sure where to start. Since I was using Sony Vegas Pro and DVD Architect (which I truly enjoy using) to make the DVD, I wanted to start with one of their products. The first thing I looked at was Cinescore, which is a loop based product (sadly, discontinued). I ended up purchasing and using it. I quickly found that I wanted more. I then played around with their ACID product and found it was not right for me. 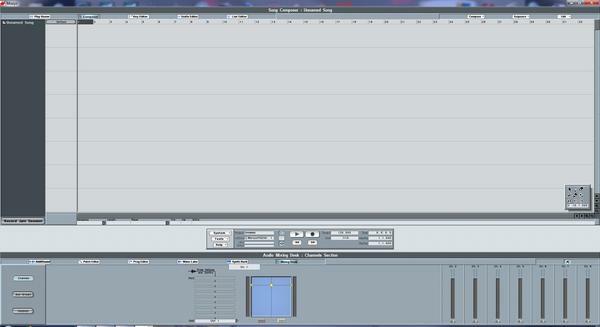 I then purchased the Magix Music Maker program. I learned quite a bit playing around with it, but discovered that the “instruments” that came with it were proprietary to that program and they were not VST’s that could be used with other DAW’s. This appears to still be the case, and in fact several of the VITA2 instruments included are limited to work with only some of their software. I then stumbled upon Reaper. I was immediately impressed with the GUI, the robust features, the different pricing levels, the frequency of updates, the constantly updated manual (there’s a concept for you) and the helpfulness of their community of users. I purchased it immediately and I have been happily using it ever since. It is, without a doubt, one of the best programs I have ever purchased or used. I really could go on and on about Reaper and the whole music making process, but I can already sense that the other forum member’s eyes are beginning to glaze over. If you would like to “discuss” this further or would like a sample MP3 of what an older than dirt accountant was able to accomplish, just PM me. Finally, thank you very much for starting this thread, as I was unaware of the Miroslav Philharmonik product. At the current price point it is a no-brainer to purchase, which I am off to do. Also - wonder what happened to CakeWalk - havent checked but it used to considered OK !! Wendy mentioned it a while back. Looks cool, elegant. Free? Hmmm. Lots to chose from. I just had to have that Philharmonic Collection, so I got it. I also got Reaper and Music Maker Premium. I have another 60 days before Reaper doesn't work. If I find that I like it, I'll pay for it. Cake Walk and FL Studios offer great apps in around the same price range. The final verdict came from the absolute eased of use with the Music Maker - and Premium was just a great deal. It was a tough choice between it and the Samplitude. But I found that I would likely be using Samplitude as if it were Maker. I like the horizontal board with wide screens better. Most of the extra bells and whistles I don't really need - as Music Maker can turn out a fine piece, itself. So I went that route to get the massive collection of sounds and clips that come along with it. as well as LMMS I have CM (computer music) which I also do not "get"
and Melody assistant which makes perfect logical sense to me! Beautiful interface. Melody Assistant come with that virtual singer, too? How does that work? Is that who we often hear in your videos, or do you morph your own voice? I'll likely end up with several composition apps and/or DAWs as time rolls by. I'm really lucky that my singer can actually master my stuff for me - or even help me with a final mix, if I need it. I really just needed an avenue for getting my thoughts to data on my computer. Still not having the time to sit down and play with this or my precious, new copy of Dogwaffle is driving me nuts! But at least I own them now. Reaper continues to torment me with it's shear elegance. It really looks nice and has plenty of no-nonsense features and effects. Not sure how much it'll ever see use, though, since Music Maker is actually a great DAW even if you never touch the loops. The effects are easy to use and the tutorials are really good and easy to find. All of which can be said about Reaper, too, however. The real proof to the pudding with come when I finally get my Keystation hooked up and start sequencing. I'm considering M-Audio's Keystation Mini 32 - 32-Note Ultra-Portable Keyboard Controller or the KeyRig 49 - Easy-to-Use 49-Note USB Keyboard for more portability. They don't offer the model I have anymore, but it resembles in size and features the Oxygen 88 - 88-Key Graded Hammer-Action USB MIDI Controller, but with even more programmable knobs, sliders and buttons. It's really great for becoming an actual control station for your DAW, using real knobs and sliders, etc, rather than a mouse. But it is a monster, and cannot be easily set up and used where space is a concern. The two small keystations I link to above are the same price. carrara render in background LOL! and yes, Virtual singer is my vocalist! But right now I need sounds more than engraving capabilities. Music Maker has a staff view, but like I said, I didn't get much play time yet. I am amazed at the variety of music loops provided with the "Premium" package that will actually be of great use to me. So far I am very happy. you will be surprise how fast you go through the loops from MM . of course you are doing yours . Digital Audio Workstation similar to FL Studio. half the notes did not work and I had already spent a small fortune fixing it a few times. still got my Boss drum machine. I've been way too busy lately to hardly touch any of my computers - except this new Win 8 64 bit Netbook my wife just got me for my B-Day just before sleep time. So I installed my new Music Maker Premium on it, and the software runs amazingly well on this tiny thing. 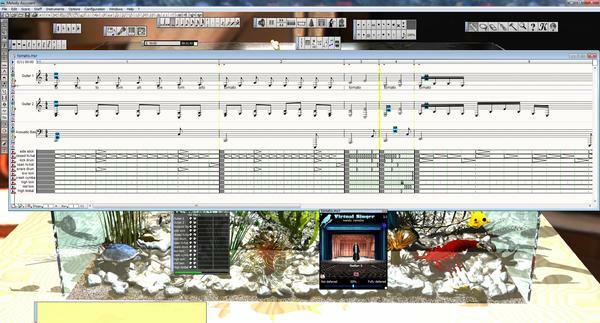 Just messing around for incredibly short periods of time, I'm amazed at the flexibility of Music Maker Premium. The midi editor will actually allow me to write my own music just by creating, placing and stretching pixels onto a staff, just like writing music, but easier, as the length of each blip determines the length of the note, without having to jot correct symbols, rest notation, etc., Very cool. I can then assign any VSTI want to be run by my creations. Making some cool soundtrack clips! So, sort of like Daz, Music Maker allows the user to create music like crazy without even needing to know how to play a lick! There's a button on the interface "Catooh" which takes you to their content marketplace where you can buy anything from individual sounds and instruments to complete soundpools that come with a few hundred files that create a collection of various loops that you can drag from the browser into the scene. Sound familiar? I can read and write music, and can play some instruments. But having Catooh lets you collect the stuff that you want. The cool part about the free collections that comes with Premium (if you go into Catooh, and get everything you've been given coupons for, it comes with a LOT) is that it helps to illustrate what to expect from those various collections. I wouldn't think of using loops from certain groups... that is until I finally browse through some of them. When music is broken down into small pieces, pieces that all fit together no matter how you mix them up, it's amazing how you'll want to use bit and pieces from various groups to get that sound you're looking for - which can really help to direct you into further sound purchases - as Catooh plays a sample of the content when you hover over it in the store - pretty cool. Amazingly enough, digging through the user's manual, which so far seems to be very complete, well written and enormously useful, reveals a powerful DAW at the heart of Music Maker! Maybe not a top-end piece, but certainly equipped to handle what I was looking for. It's funny how I was looking at the idea of loops and soundpools as a fun pastime that just happens to come free with the software I wanted to use. They turn out to be far more useful than that. You see, you can add a loop file and go in and change it however you like - if you're into that sort of thing - I sure like it! This means that I can use the soundpools to get close, and edit them to be what I want - without ever hooking up my keyboard! Pretty cool stuff. You can buy complete songs from many genre. Video effects, you can add images and video and stretch them to do what you want with your music and vice versa. Quite impressed = me! Both of which could benefit from a good DAW, but I like your approach! Old school is where I've lived my whole life... and I love it there. Love that Monarch amp! Well, the keys too. When I worked in the industry, Yamaha and Roland were both incredibly trusted names - and have been since they began business way back when. Casio began looking more like toys, but really jumped ahead towards the big league somewhere in the 80s. Many other good names out there. 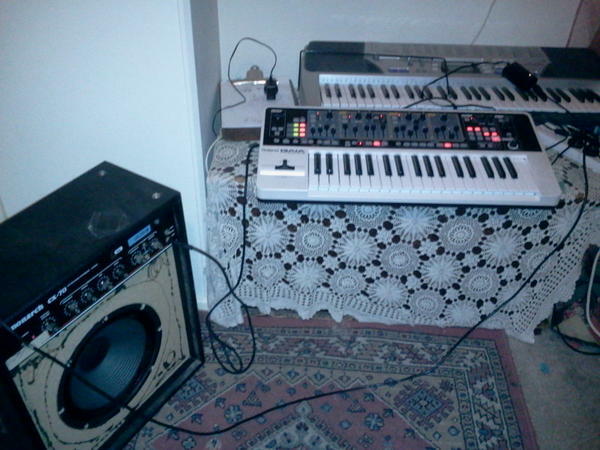 But I've never seen anyone go wrong with a Yammy or Roland, who also makes those great Boss guitar pedals and such. Can't wait to check out some new jams from our girl! In periods of very little time, I've really been enjoying using Magix Music Maker Premium as a very Carraraesque Music building machine. I've purchased a few more soundpools for it - which each came with more than 500 loops per pack, and the collection of stuff just got highly enormous. Very soon I'll have my Keystation Pro hooked up to it, and rather than my original intentions of just recording an entire score to the DAW, I'm going to add my writings as usable loops, like the Catooh Soundpools packs. Then I'll have more flexibility of making various background tracks to mach the on screen action. Really looking forward to that. My guitarist almost died on us. He's been struggling with a lung disease for years and has really attacked him a month or so ago - and was in critical condition for two days and nights - and remained hospitalized that whole week plus a couple days. Now he's recovering so very slowly that he has announced his permanent retiring from the band. We have a great guitarist coming in to fill his role, but not his shoes. We (My singer and I) told him that the door is always open - any time, any gig, anywhere. He's now under 80 lb.s from his usual 90 something - just a skinny little guy. But I'm praying for him every day. Very cool! You made the tunes too... That's very cool, Wendy! I have been too bogged down to mess with mine of late. But I have a really cool base soundtrack for the title sequence of my upcoming episodes that really turned out cool, I think. I still haven't tried using my midi controller with it yet. That will expand it to new heights and allow me to make my own scores - really excited about that. Thanks for sharing your wisdom and cool projects! Dug up this necrothread (and corrected a typo in one of my posts ) because I have been playing with LMMS a bit and also various VSTi using Savihost to make a midi playable and recordable instrument. Grabbed another playable sampler, Magix Independence free and its 2GB of samples which I can also play via midi but not so easy to record result, I guess I need Magix musicmaker for that. Audacity using stereomix feeds back. I also have Presonus Studio one which came with my mini midi controller I got for easy playing that uses Presonus plugins. So many incompatable sounds grrrrr. Youtube is nuts lately detecting matched content Carrara animators really need to roll their own stuff so maybe this thread needs some more discussion, been talking music options with Misty on Skype too so I know she would find this thread interesting. midi files might work in sonyacid. free you say? still nebulous on the soft synth concept. midis might work in sonyacid. free you say? Midi's work in most things, its the instrument plugins that do not between many apps. Basically a DAW tells a (soft)synth via MIDI what note to play. The sound the softsynth plays can be completely computer generated or a wav sample or something in between... a computer modified sample. Reversing this process and getting MIDI out of a sample can be done with Melodyne or with VariAudio if you have Cubase. I mostly use an iPad to do music these days, I find it much more convenient than a desktop setup. If you have a soundfont player, there are a very good set of orchestral samples for FREE called Sonatina Symphonic Orchestra. Usable on any platform that has a soundfont player. I recently got Auria Pro for the iPad ($50) which has a soundfont player build in, plus a couple of synths and various effects. I am slowly coming to grips with LMMS but one huge drawback is the inability to record live audio input so keep going back to good old Audacity. I am thinkng I actually need two computers for what I want to do, a performance one and a recording studio one. It would solve the Magix Independence sampler recording issue, another possibility is to use mono tracks and record left to right, not sure, the soundcard feedback issue of using any computer generated sound in live performance is the biggest issue for me. Maybe i need to use headphones out to my ipad and garage band! according to sony's acid forum, bestengine can work as an acid plug in.